When Heat Kills: Global Warming As Public Health Threat : Shots - Health News Emerging science shows that people respond more favorably to warnings about climate change when it's portrayed as a health issue rather than as an environmental problem. Should the symbol for danger be a child instead of a polar bear? 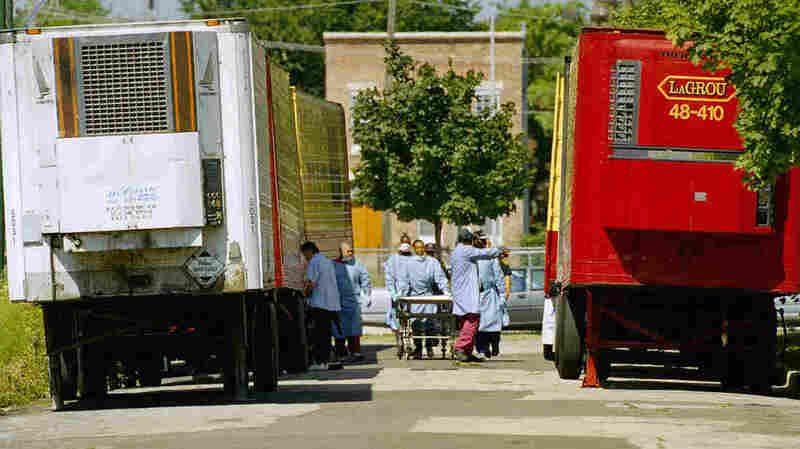 Cook County morgue workers walk between a row of refrigerated trucks outside the morgue in July 1995, when a deadly heat wave struck Chicago. Epidemiologist George Luber at the Centers for Disease Control and Prevention says the most obvious risk from a warming world is killer heat. A deadly heat wave that struck Chicago in 1995 made many people aware of how disastrous sustained high temperatures can be. About 750 people died from the heat in Chicago, "and that was amplified by the European heat wave of 2003, where we had over 70,000 excess deaths attributable to the heat wave," he says. Today, Luber's job at the CDC is to deal with health issues related to climate change. And heat waves are just part of his portfolio. Hot air causes more smog, which in turn causes more asthma. Also high on his list are deadly storms, which are likely to become more powerful as the world warms. Infectious diseases can also increase their ranges as the climate changes. "This is a new topic for public health," Luber says. "This is emerging largely as a result that the scientific evidence around climate change has evolved to the point that public health feels confident engaging the science — that this is a credible threat." The whole issue of climate change is now so intensely politicized and so intensely fought over, if you put a foot wrong in any regards, if you make a claim that can't stand up, it then becomes ammunition in this intense culture battle that we have. And health officials are messengers with special credibility. They're trusted far more than politicians, journalists, environmental activists and other widely heard voices on this topic. Luber and his colleagues may not wade into the contentious issue about the role that human beings play in warming up the planet, "but when we show the evidence that a changing climate does affect their health, people become very concerned and believe it ought to be addressed." In the past few years, social scientists have been exploring this issue. Matthew Nisbet, an associate professor in the School of Communication at American University, and colleagues have found that people who are indifferent, or even hostile, to climate change are more receptive to the issue when it's talked about as a health issue. It has far more appeal than when it's framed as an environmental issue — or as a matter of national security. "Not only does it lead to emotionally engaging responses among a broad cross section of Americans, it also helps to localize the issue for people and to view the issue as more personally relevant," Nisbet says. It resonates with conservatives and liberals, and even among the broad segment of the public that just doesn't think about climate change. The so-called disengaged segment of the population "found the public health frame about climate change the most engaging and the most emotionally compelling," Nisbet says. He thinks these findings could define common ground, on an issue that has become deeply politicized and polarized. "The idea of protecting people, the innocent especially, from harm, and caring for the innocent, is a value that's widely held across the political spectrum," he says. But George Marshall, at the Climate Outreach Information Network in Oxford, England, has his doubts. His nonprofit has also been trying to figure out how to build public consensus on the issue. "The whole issue of climate change is now so intensely politicized and so intensely fought over, if you put a foot wrong in any regards, if you make a claim that can't stand up, it then becomes ammunition in this intense culture battle that we have," Marshall says. For example, some people have been tempted to draw a connection between this year's big outbreak of West Nile disease and climate change. But the link isn't nearly as direct as, say the link between smoking and lung cancer. Scientists will tell you that warmer conditions favor West Nile, but it's hard to pin a specific outbreak on changing climate, just as it's hard to blame climate change for any given storm. And Marshall says worries about disease won't necessarily motivate people to take action against climate change. "There's a real danger people will just hold their hands over their ears and say, 'I don't want to hear this! I don't want to hear there's going to be more malaria, there's going to be more West Nile virus, or worse ozone or there's going to be more asthma,' or any connection you might be able to make for climate change." He says people will respond to ideas that help them personally, help their families, and help their communities. And there's clearly a role for talking about health and climate change in that context. "What we do know, though, if you go a step further and say, 'Hey it's everybody's responsibility to give things up and cut down in the interests of saving the planet,' then you're really in for trouble." He says to look at what happened during the Republican National Convention. Presidential hopeful Mitt Romney got a good laugh from the audience when he declared, "President Obama promised to begin to slow the rise of the oceans and to heal the planet." Obviously, a deeply environmental message doesn't resonate with a large segment of the American public.